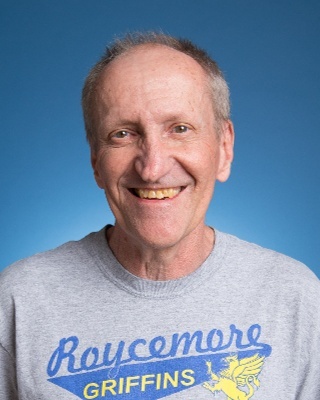 Rob Linkhart has served as Athletic Director and a PE teacher at Roycemore School since 1976. Rob’s early work life including caddying at the Gary Country Club and flipping burgers at US 30 Drag Strip. He paid his college tuition by working summers at US Steel. Rob started his career at Roycemore School after receiving his Bachelor’s degree in Education from Indiana University. He earned his Masters in Education Administration from Northwestern University while working at Roycemore. He enjoys the opportunity to develop his own curriculum as he works with students from age three through grade 12, and is especially proud of the Awareness classes he has taught middle school boys over the last 40 plus years. Rob’s son Bobby graduated from Roycemore in 2017 as a lifer. Rob lives with his wife, son and mother-in-law in Chicago. I come from a family of teachers. All three of my sisters and my mother were educators. When I first chose to be a PE teacher, I think the idea of being in a gym all day, leading games and shooting baskets was incredibly appealing. The reality of teaching, of course, is far different than I thought it would be. It’s hard work, but it’s extremely satisfying work. I never get tired of seeing young people mature and improve their abilities as they grow up before my eyes. Because I’ve been teaching for so long, many of my former students are adults with families and careers. When students come back to visit, or contact me on social media, or even enroll their own children at Roycemore, I realize how fortunate I have been to have the continuity of a long career at the same school. One thing I’ve worked hard on maintaining is how it feels to be a kid. I remember what I felt like to be a student, and so now that I’m the teacher I try to respect the feelings of my students. It was the first school that hired me after graduation, and it was close to home. That’s why I took the job, but I stayed because of the community, the ability to develop my own curriculum, the amazing student body, and it just felt like a family.